Kenya Rugby Union (KRU) has appointed Briton William Webster as Kenya Sevens coach, replacing Innocent Simiyu, who has been fired. Webster has been Simiyu's deputy for one season. A source at the Union indicated that Webster will guide the team through the Rugby World Cup Sevens due July 20 to 22 in San Francisco, USA. The KRU board will then meet to decide whether Webster will continue or they shop for another coach. Before being appointed as Simiyu's deputy, Webster had been with Homeboyz, assisting the team when Paul Murunga was busy with Kenya Sevens as Benjamin Ayimba's deputy. Webster was one of those who had applied to replace Ayimba in 2016, but failed in his quest with Simiyu taking over. Simiyu went for one season without a deputy. The Kenya Rugby Union said that they had mutually parted ways with Simiyu effective immediately. 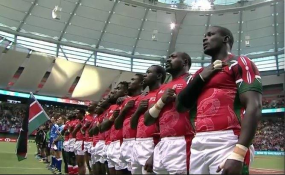 A statement from the Union indicated that Simiyu took full responsibility for the display that saw the playing unit blank out sponsor's branding in Paris Sevens which negatively impacted our country and sponsor's image. "We are fully aware that the Rugby World Cup Sevens is around the corner and are taking the necessary steps," said the statement.